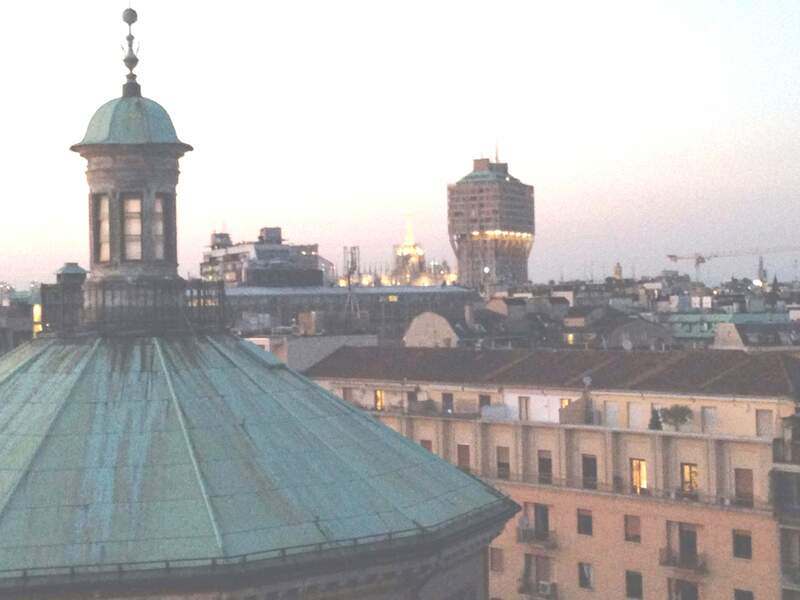 Milan’s great masterpieces are often hidden away: they are best discovered strolling around unhurriedly and keeping a watchful eye for hidden details. One of these masterpieces is the millennial bell tower, still in operation, built next to the Romanesque church of San Celso. Its long story starts in 374 AD, when Saint Ambrose (the beloved patron saint of the Milanese) was the city’s archbishop. By religious choice, he built four basilicas beyond the Roman walls, in what was then open countryside. Three of them, Sant’Ambrogio, San Nazaro and San Simpliciano, are still actively used today, and are located inside the current city centre. Ambrose chose to place these basilicas where, at the beginning of the 4th century, the bodies of martyrs barbarously killed during the Christian persecutions had been buried in holes dug in the ground. This practice was meant to avoid triggering religious fanaticism: the laws of the time did not allow to mark with gravestones the burials of those who refused to worship the pagan gods. As a consequence, their bodies had to be buried in the fields and left unmarked. All this came to an end after 313 AD, when the Edict of Milan by Constantine gave Christians freedom of worship. Since that date, digging beyond the walls, people would occasionally find human remains, often with sealed boxes next to them, containing notes on the names of the victims and the tortures they had suffered. According to biographers of the time, Saint Ambrose, who allegedly had a diviner’s gift, found some of those bodies using his bishop’s crosier, had them exhumed and then properly buried inside worthier basilicas. Of the several witnesses who related these extraordinary events, biographer Paolino came up with a pretty accurate description. He tells us how on May 10th, 396, Ambrose was meditating in an orchard along the Via Emilia, when he had one of his extrasensory perceptions: he sensed that two martyrs were buried right there. The excavation that followed brought to light one remarkably well-preserved body, with traces of coagulated blood. On its decapitated head, traces of facial hair were still visible. Of the second body, only bones were left. Thanks to the notes found next to the remains, we have some information on their lives and also their names: they were Nazaro, a senior preacher, and Celsus, a young follower, about 18 years old. According to Christian beliefs, the good preservation of a body is a sign of sanctity, so the exulting population organized a procession to place Nazaro’s body in the nearby basilica Apostolorum (the current San Nazaro in Corso di Porta Romana). As for young Celso’s bones, Ambrose decided to place them in a beautiful white marble sarcophagus decorated on three sides, then he planned to enclose the orchard, and at the exhumation site he placed a tabernacle with a fresco of the Virgin and Baby Jesus (which is thought to be the first Madonna ever painted in Milan, and one of the first of the whole Christian world). Finally, Ambrose decided to build a small church nearby dedicated to San Celso. Unfortunately, there are only traces left of epigraphs and sarcophagi belonging to this building, since on the 600th anniversary of the event, in the Romanesque period, Archbishop Landolfo demolished the small rundown church, and built a basilica with a 30-metre-high bell tower and a monastery to accommodate the Benedictine monks. The tabernacle with the sacred images, always considered miraculous and object of great veneration, was left outdoors. 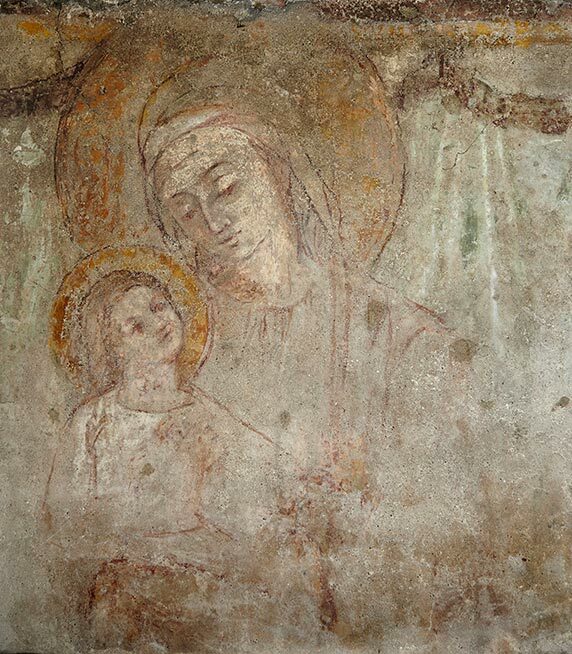 Only in 1430, in order to protect the painting, a small church for only 300 people was built and inserted as a transept into the Basilica of San Celso. As was common in those times, the image was placed on the major altar and covered with a curtain that could be removed only on solemn occasions. All this changed radically after 30th December 1485, due to a miracle that occurred while a nasty plague was raging in the city. 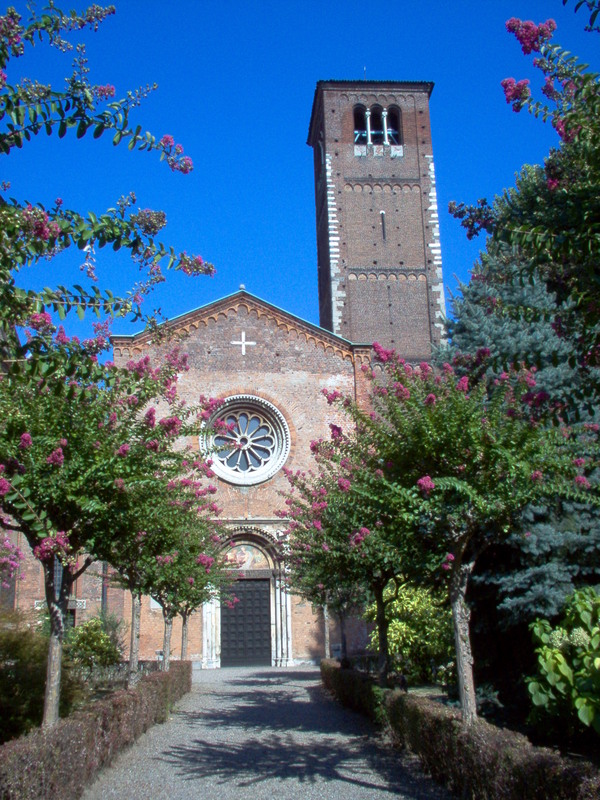 There are many sworn depositions by the Milanese who testified how, while they were in San Celso for the 11 o’clock Mass, celebrated by the priest Giovanni Pietro Porro, during Communion they saw the veil protecting the image move away, and the Virgin Mary appeared to show them the Son of God. From that day the plague began to recede. The grateful Milanese decided to demolish the small transept in 1489 and on San Celso’s left side they built the current great sanctuary dedicated to Santa Maria dei Miracoli (Saint Mary of Miracles) in order to keep the venerated image inside a prestigious temple. The construction, in 1493, was entrusted to some of the greatest Renaissance architects, such as Giovanni Antonio Amadeo, Gian Giacomo Dolcebuono, Cristoforo Solari, Galeazzo Alessi, and perhaps supported by Florence-born Donato Bramante who was in Milan in those years. Although completed in 1506, the temple was considered too small; two side naves were then added, under the direction of Cesare Cesariano, who finally completed the sanctuary in 1528. Soon to become one of the most important city’s monuments from an artistic, historical and religious point of view, the temple ended up overwhelming the old Romanic church nearby, which was left unused. In the nineteenth century, it was even decided to knock down four of San Celso’s bays to open three windows into the new building. The Romanic facade was then demolished and rebuilt in front of the last two bays at the bottom of the current small garden. In the 1900s the entire monastery was razed to the ground. Now, after 1600 years, the Milanese wish to commemorate those holy places and reopen the restored Medieval remains to the public. Two guided tours are currently available, on Sunday 8th at 17.00 and on Sunday 15th at 16.00. €22. The visit includes the sanctuary, where the Virgin’s fresco is visible at the left of the main altar; the nearby garden, with the church of San Celso and its ancient tower, with the bell still striking after 1000 years. The more adventurous can climb the 170 steps leading to the top, admire the city from above, and take 360° selfies.